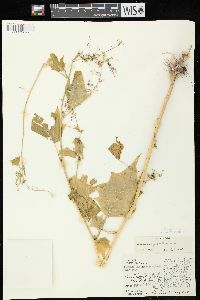 Stems erect, branched, 3-15 dm, glabrous. 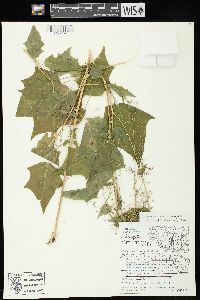 Leaves nonaromatic; petiole 0.15-0.45 cm; blade ovate to triangular, 3.5-15 × 2-9 cm, base cordate to truncate, margins sinuate -dentate with 1-5 coarse, acute teeth, distal leaves entire or with few small teeth, apex acute, glabrous. 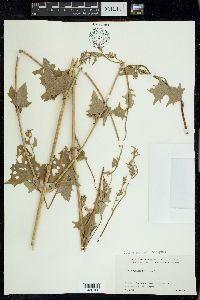 Inflorescences glomerules in terminal and lateral spikes and panicles, 6-15 cm; glomerules irregularly globose, flowers in different stages of development, 0.5-2 mm diam. 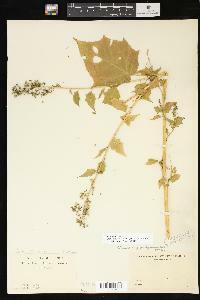 ; bracts absent. 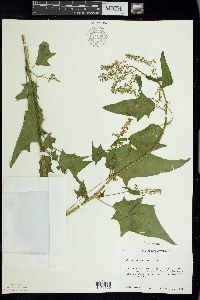 Flowers: perianth segments 5, connate into 0.5 mm tube; lobes ovate to lanceolate, 0.7-1 × 0.4-0.6 mm, apex retuse, slightly keeled, glabrous, margins meeting or separated by as much as their width, exposing more than 1/2 fruit at maturity; stamens 5; stigmas 2, 0.1 mm. 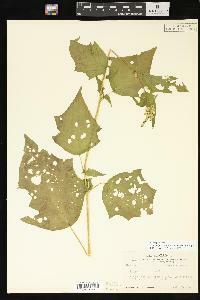 Achenes depressed-ovoid; pericarp adherent, chartaceous, smooth. 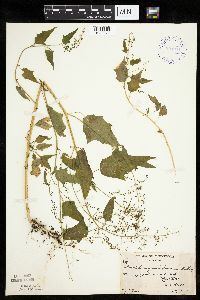 Seeds lenticular, 1.3-1.9 mm diam. 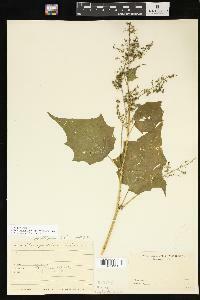 ; seed coat black, indistinctly honeycombed to nearly smooth, margins rounded. 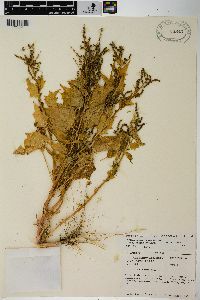 2n = 18. 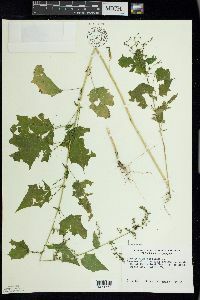 Fruiting Jul-Oct. Woods, thickets, hardwood slopes, wooded tallus, nutrient-rich woods, sometimes in waste places and fields; 0-1800 m; Alta., B.C., Man., N.B., N.W.T., N.S., Ont., Que., Sask., Yukon; Alaska, Ark., Calif., Colo., Conn., Del., Idaho, Ill., Ind., Iowa, Kans., Ky., La., Maine, Md., Mass., Mich., Minn., Mo., Mont., Nebr., Nev., N.H., N.J., N.Mex., N.Y., N.C., N.Dak., Ohio, Okla., Pa., R.I., S.Dak., Tenn., Tex., Utah, Vt., Va., Wash., W.Va., Wis., Wyo. 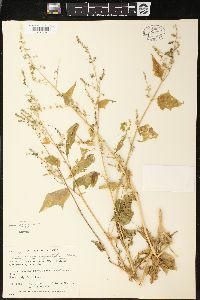 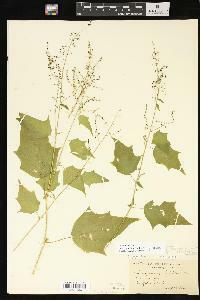 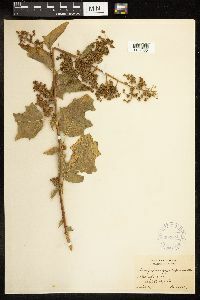 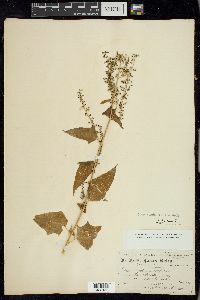 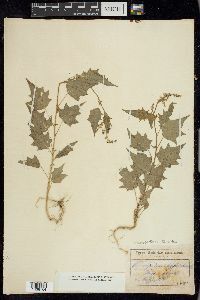 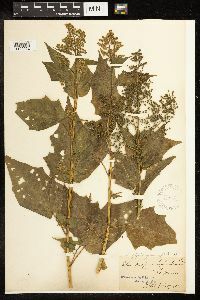 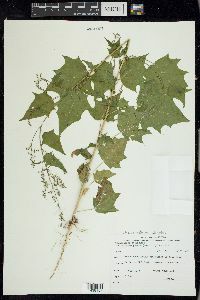 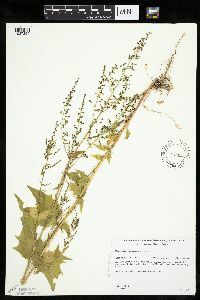 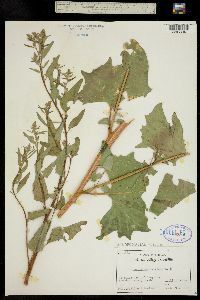 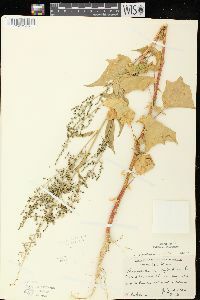 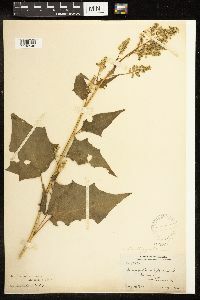 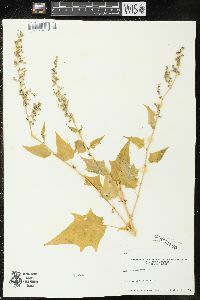 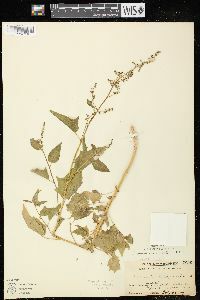 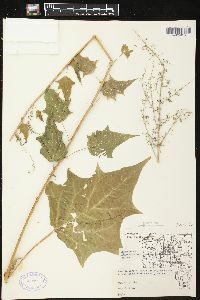 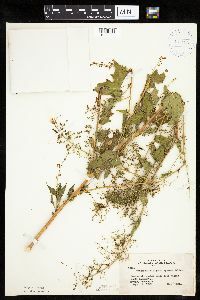 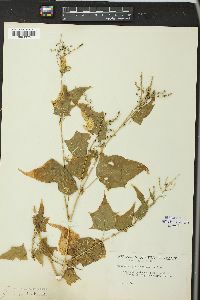 A closely related Eurasian diploid species, Chenopodium hybridum Linnaeus, probably also occurs in North America as introduced. 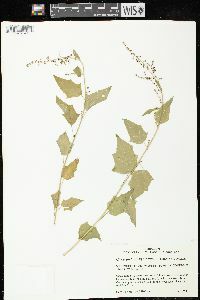 Its occurrence in the New World needs confirmation. 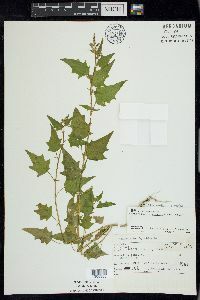 Chenopodium simplex differs from its Eurasian counterpart in having a smoother seed coat, a yellowish pericarp that is more adherent to the seed, and a different chromosome number (A. I. Baranov 1964; R. D. Dorn 1988b). 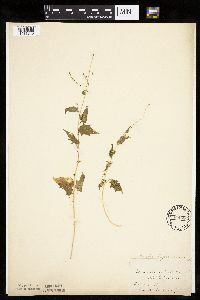 Annual herb 30 cm - 1.5 m tall Stem: upright, branched. 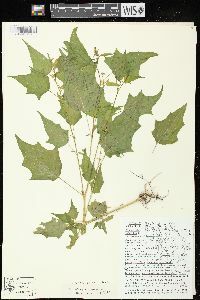 Leaves: alternate, stalked, 3.5 - 15 cm long, 2 - 9 cm wide, triangular to egg-shaped with a flat to heart-shaped base and pointed tip, wavy-toothed, with one to five large teeth on each side. 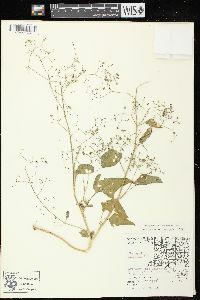 Inflorescence: a 0.5 - 2 mm wide, irregularly round cluster of flowers (glomerule), which together form spikes and larger branched inflorescences (panicles) that are 6 - 15 cm long. 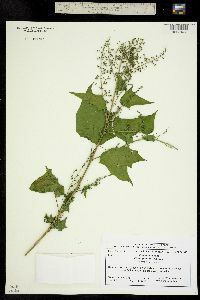 Flowers: greenish, small, without petals, with five sepals fused into a 0.5 mm long tube. 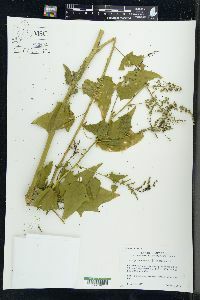 Sepal lobes to 1 mm long, lance-shaped to egg-shaped with a notched apex, slightly keeled. 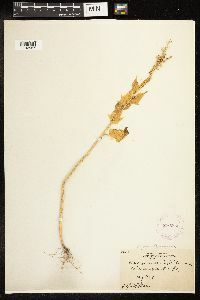 Stamens five. 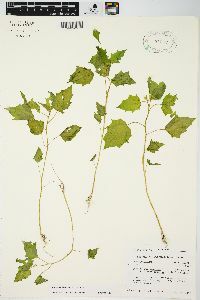 Stigmas two. 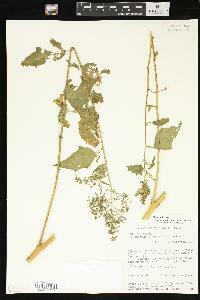 Fruit: one-seeded (achene), partially enclosed in the persistent, incurved sepals, depressed egg-shaped, thin-walled. 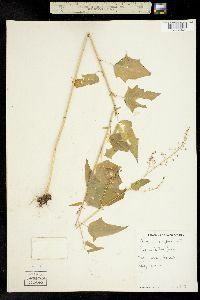 Wall (pericarp) adhered to the seed, papery. 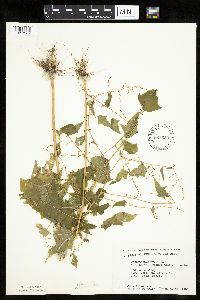 Seed horizontal, black, shiny, 1 - 2 mm wide, lenticular (lens-shaped), round-margined, obscurely honeycombed to almost smooth. 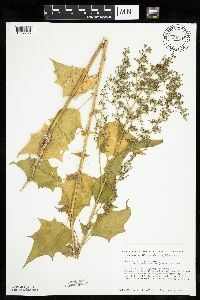 Habitat and ecology: Widely distributed in the Chicago Region but not abundant as a weed. 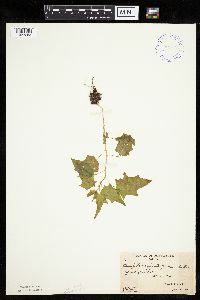 Often found in disturbed areas where competition has been reduced, such as where logging or fire has recently occurred. 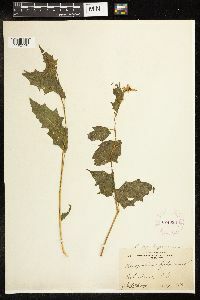 Etymology: Chenopodium comes from the Greek words chen, meaning goose, and podion, meaning "little foot," referring to the leaf shape of some species. 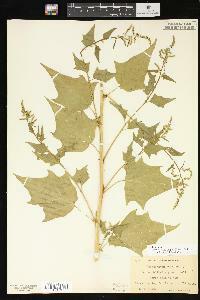 Simplex means simple or unbranched. 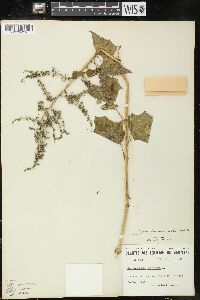 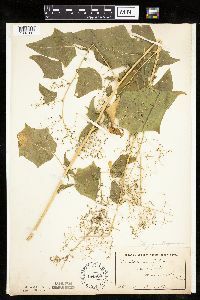 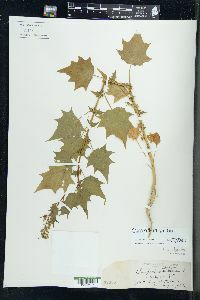 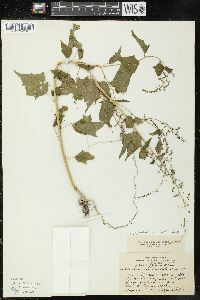 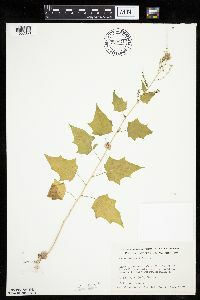 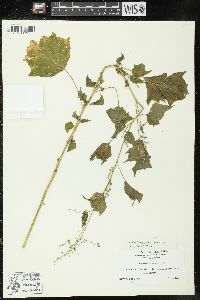 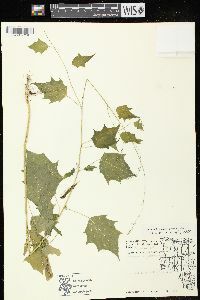 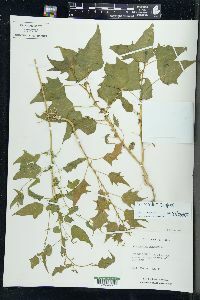 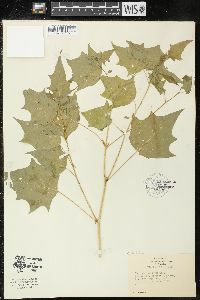 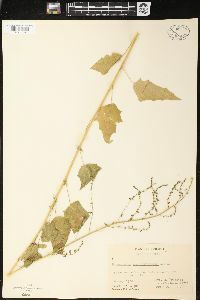 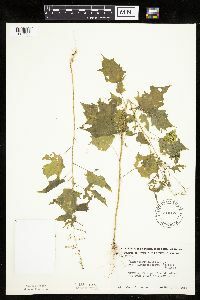 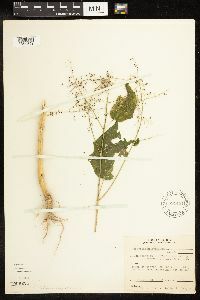 All specimens from America identified as C. hybridum L. should be referred to this species. 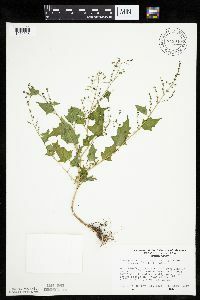 Its more or less smooth seed with its relatively easily detachable perianth separates it clearly from the European plant. 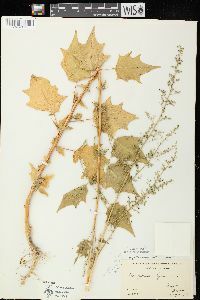 It occurs in sandy fallow fields, and open or moist woods. 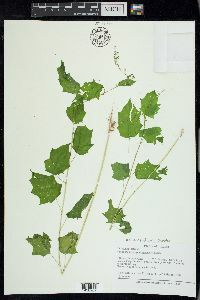 Erect, bright green annual to 1.5 m; lvs long- petioled, broadly ovate to deltoid, 5-20 cm, acute or acuminate, truncate to rounded or cordate at base, bearing on each side 1-4 large, salient teeth separated by broadly rounded sinuses; infl a loose, sparsely fld, terminal panicle of short, interrupted spikes, the branches often white-mealy; cal sparsely or not at all mealy; seeds horizontal, loosely or tightly enclosed in the readily separable pericarp, shiny-black, obscurely striolate, 1.5-2.5 mm wide, with a bluntly keeled margin; 2n=36. 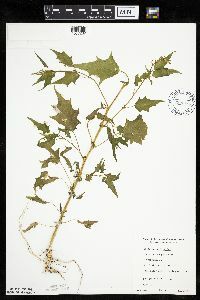 Disturbed ground and moist woods; Que. 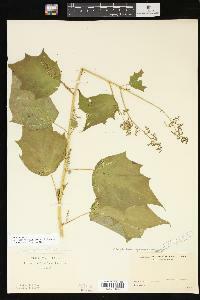 to Yukon, s. to Va., Ky., Ark., Tex., and Calif. (C. gigantospermum) Closely allied to the European diploid C. hybridum.